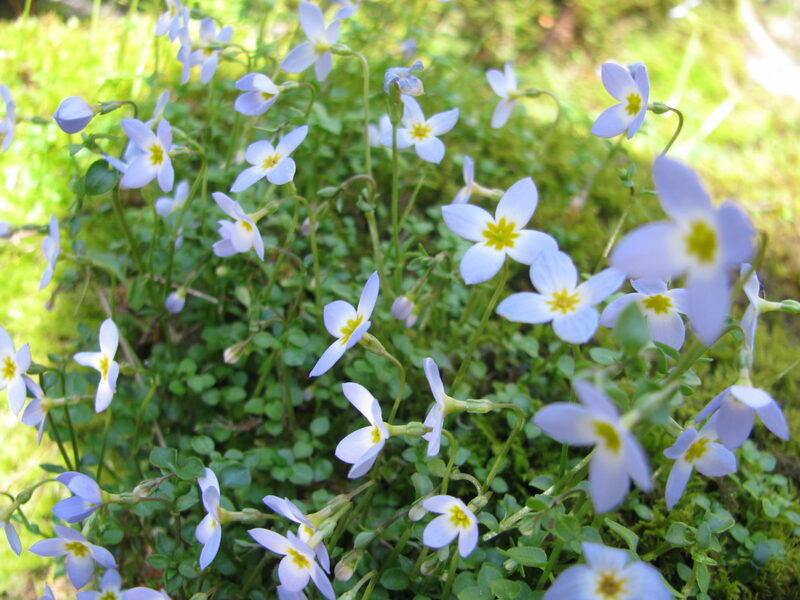 Another beautiful species from the Smoky Mountains is the thymeleaf bluet or Houstonia serpyllifolia. I guess I am a big fan of the Rubiaceae (the coffee family) as this is my sixth Rubiaceae post! This is also the second post on the Houstonia genus, as I have already discussed Houstonia caerulea or the azure bluet. Thymeleaf bluets look fairly similar to azure bluets, however thymeleaf bluets form dense mats and have unique leaves. 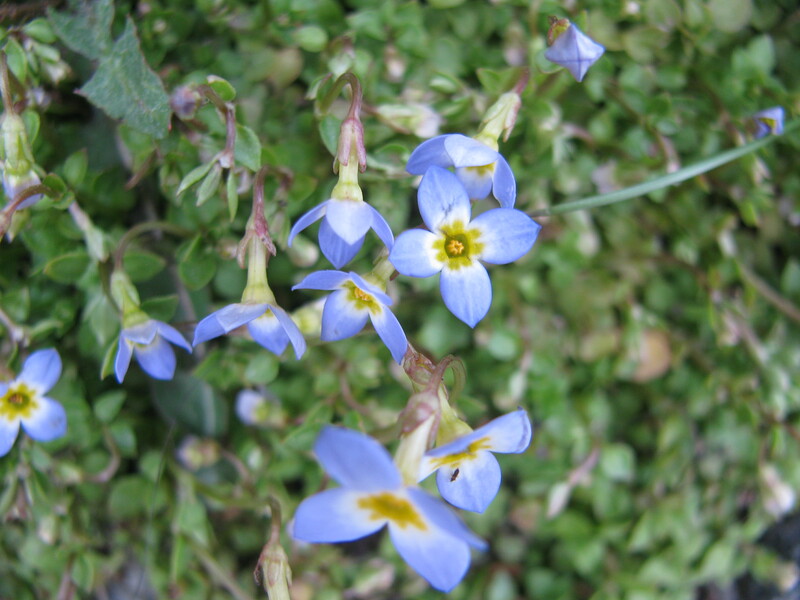 Azure bluets have leaves with no petiole (leaf stalk), while thymeleaf bluets have distinct leaf petioles. The specific epithet serpyllifolia means thyme-like leaves, as the scientific name of wild thyme is Thymus serpyllum. Flowers in the Rubiaceae, including thymeleaf bluets, have symmetric (actinomorphic) petals fused in a tube called a corolla. Flowers in the Rubiaceae also show heterostyly (‘different styles’) which means there are two different orientations of the styles (stalk that holds up the stigma, the female floral part that catches pollen). For Houstonia flowers with short styles, you can see the anthers (hold pollen) but not the stigma. There is a bulge in the corolla near the base of the petals. For long style flowers, you can see the stigma but not the anthers, and there is not a clear bulge in the corolla (The Native Plant Society of New Jersey: Spring Photo Gallery – Bluet). Heterostyly ensures cross-pollination, as long style flowers can only be pollinated by short style pollen and vice versa. Cross pollination allows for mixing of genetic information between different plants. This increases genetic variability of the offspring which allows for greater adaptation to changing environments (Spira, Wildflowers & Plant Communities of the Southern Appalachian Mountains & Piedmont, 2011). 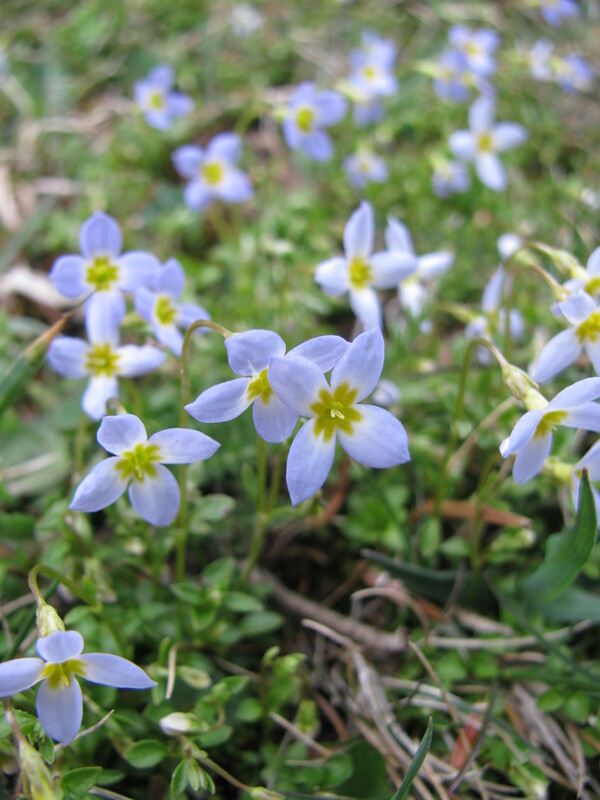 Another common name for thymeleaf bluets is the Appalachian bluet, as it only grows in the Appalachian Mountains from Pennsylvanian to Georgia. 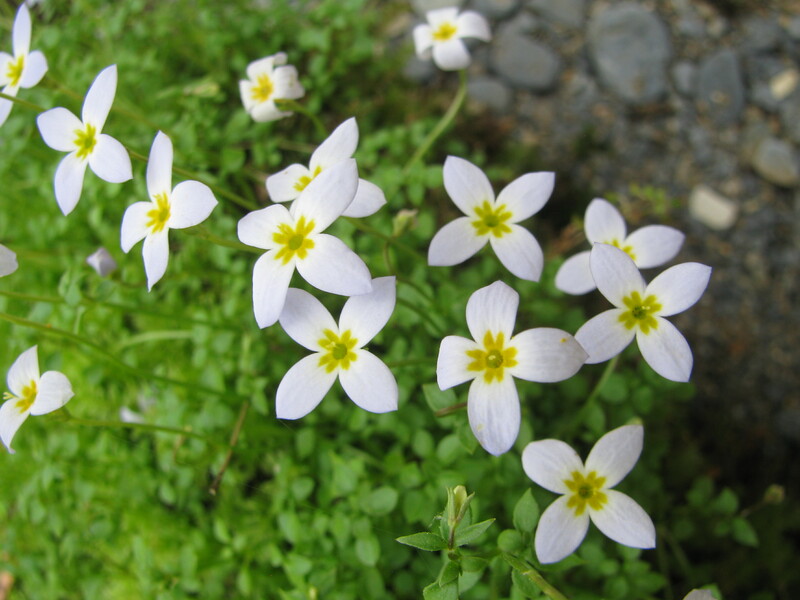 They are considered endangered in Kentucky (USDA Plant Profile: Houstonia serpyllifolia). 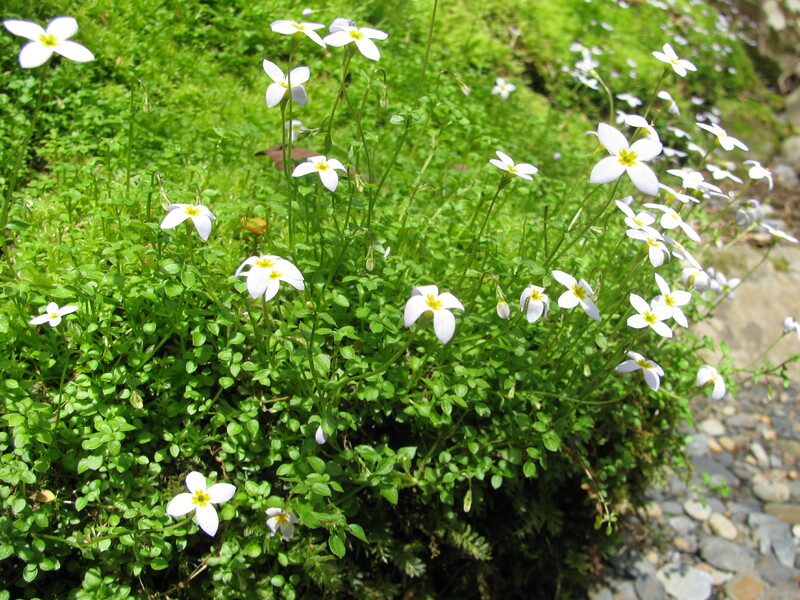 They live in wet areas such as moist meadows and rocky seeps, and I saw them along streams in forested areas (Spira, Wildflowers & Plant Communities of the Southern Appalachian Mountains & Piedmont, 2011).